This has actually been a long time coming… some months ago, I decided to write a series of very short blog posts reviewing microphones that could possibly be suitable for VOICEOVERS. Thanks to some very generous suppliers, I have been testing some pretty darn impressive microphones. This week, we take a look at the PELUSO Vacuum Tube Ribbon Microphone. “This is the Vacuum Tube version of the R 14 Ribbon Microphone. It offers enhanced output level and a stunning response due to the perfect impedence match with the amplifier. The design of this microphone is inspired by classic ribbon microphones with the addition of a tube stage to provide added gain. It has a natural rich and silky sound with additional harmonic complexity provided by the tube stage. It is the perfect complement to your microphone collection, offering a distinct color difference from condenser microphones. The microphone comes as a complete system, with Microphone in Wood Box, and Shock Mount, Power Supply, 7-Pin Cable packed in an attractive Flight Case. As stated, this unit comes with it’s own power supply/preamp. My testing method was to record a similar script for each mic, in the same booth and with no processing. I actually don’t want to say much about the unit – I’d prefer you to hear and decide for yourself. (Feel free to leave your thoughts in the comments section) For the money, this mic didn’t cut it for me personally, but in saying that everyones voice is different and the same mic does NOT suit everyone. Soon, another mic to listen to – that you’ll be able to compare with this one. Clean audio, but seems somewhat muted in punch. 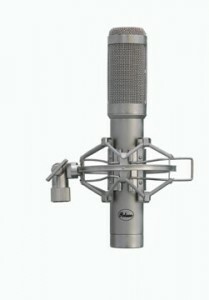 It may be a good mic for “quiet” long form narrations.